I was perusing the news feeds when I came across this lie-fest from June. No, they weren’t meant to support entire families. But when NAFTA and other so-called “free trade” treaties were passed and decent-paying manufacturing jobs were, not surprisingly, shipped to other countries where workers as young as ten are paid slave wages under slave conditions, that was the beginning of a trend that has resulted in part-time, minimum-wage (PTMW) jobs being the primary source of income for all too many Americans. Most end up having to hold down two or more PTMW jobs just to support their families, and all too often they rarely see their kids, and are caught in the tug-of-war between multiple employers demanding full availability even though they don’t provide full time hours. Funny how that gets left out. The part time position was not intended to pay for a house, it is a stepping stone to move on. Of course when this happens, like it did today in Los Angeles, the poor and unskilled workers will go on Welfare, and cost American workers more to support them. McDonald’s recently came out with their answer to those that want $15/hr pay. This month in Europe McDonald’s hired 7,000 touch-screen cashiers. Oh, if only those “lazy”, “greedy” workers hadn’t been so uppity! Why couldn’t they have been happy working for peanuts? 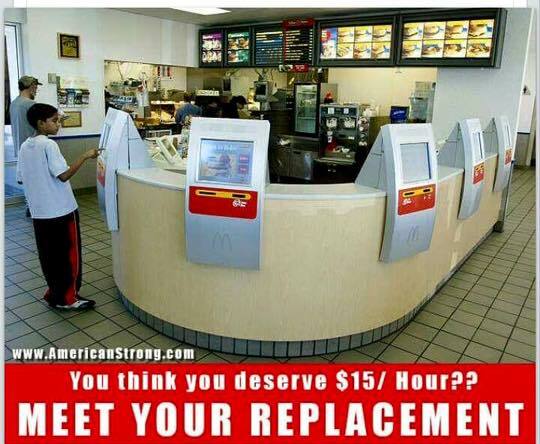 If McDonald’s hadn’t been required to pay decent wages, why, they never would have had to replace them with robots! So the notion that the wage increase was the cause of the layoffs is a lie. McDonald’s executives have been mismanaging the company for years, so naturally that’s going to cause a slump in returns. Add to the mix the ongoing, never-to-end recession that continues to keep wages down and unemployment up. It’s not difficult to do the math and understand that, because fewer people are working and for lower wages than they enjoyed previously, we’re less likely to throw our money away on unhealthy food we can do without anyway. But the message being sent by the likes of Hoft is clear: “Don’t ask for higher wages or we will replace you with robots.” It’s a classic scare tactic used by corporations to silence demands for wages that keep pace with inflation. It works much more often than it has any right to, but now even that threat is losing its power as people realize that wage increases don’t necessarily mean a rise in inflation or unemployment. Even businesses traditionally resistant to wage increases now see the up-side to them in that ultimately they lead to greater profits as people have more surplus disposable income to spend. That doesn’t stop corporate assholes or their media flunkies from pushing those tired old fear-based tactics, though. We have to keep challenging the lies and make it clear that lower wages in return for more work is an unacceptable. If businesses expect more work out of employees, then employees should receive fair and just compensation for it.